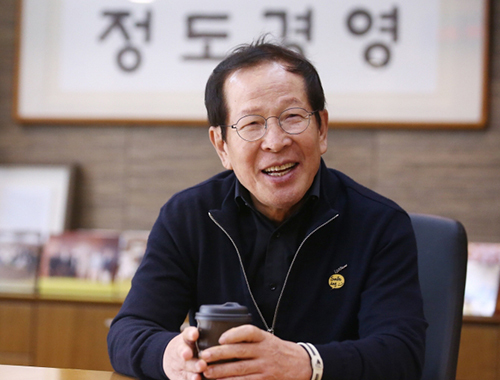 Kwon Won-kang, founder and chairman of Kyochon F&B Co., South Korea’s No. 1 fried chicken franchise operator, announced he was retiring to leave management in the hands of a professional chief executive. In a ceremony celebrating the 28th founding anniversary of the company on Wednesday at its headquarters in Osan, Gyeonggi Province, Kwon told employees he was leaving the company. The founder will put down both chairman and chief executive positions at Kyocho F&B. The company will be headed by Hwang Hak-soo, president of Kyochon F&B. “The future remains uncertain without innovation in management especially in a rapidly transforming external environment,” Kwon said. “I judged that a more transparent and professional management system is needed… to bring change and innovation for a better future,” he added. Kwon is a self-made businessman in the franchise industry who founded Kyochon at the age of 40 after trying out various precarious jobs. He started his chicken shop in a small, 10-pyong store in Gumi, North Gyeongsang Province, in March, 1991, and soon created a wave and crave for chicken caramelized with soya sauce through the country. Kyochon F&B, the industry leader with 318.8 billion won ($281.5 million) in annual sales, is also regarded as successfully managing franchises and promoting shared growth with franchisers. Kyochon F&B currently manages about 1,100 franchises, which has remained almost unchanged from 15 years ago when the number of franchises hit 1,000 stores in 2003. Kyochon F&B raises the highest annual sales per franchise among 450 chicken franchise brands. Last year, however, Kyochon F&B came under fire after a video was released of the chairman’s relative assaulting staff members.